When given the opportunity to design a new Kosher kitchen for this Atlantic Beach home, Ellen Lopez of El Design Studio had many things to take into consideration. Not only was she tasked with creating a gorgeous, useable space, but she had to fit double the usual kitchen necessities inside to design a true Kosher kitchen. She had a fairly large area to work with, but she was challenged by the need to provide separate kitchen storage, preparation, cleaning and cooking areas for meats and dairy while keeping her design upscale and beautiful. Of course, she met these challenges and gave the owners an award-winning kitchen that reflects their deep convictions and grand sense of style. Lopez’ favorite aspect of this kitchen is how all of the elements come together. Though the chevron-style flooring makes a bold statement, the two-tone cabinets in Benjamin Moore Tweed Coat and White Dove don’t compete. The grey keeps the lower cabinetry grounded while the white upper cabinets keep things bright. In addition, the Cambria Quartz countertops in Berwyn bring all the colors and tones together. “It all feels like it belongs, and nothing is overpowering,” says Lopez. The real story of this kitchen, though, is its functionality. Lopez created a Kosher kitchen that flows well for the home owners. In addition to double sinks and dual prep spaces, the owners chose a Monogram double oven. It offers a level of sophistication that goes well beyond its impeccable craftsmanship—it’s Kosher user friendly. These ovens provide a Sabbath mode where, to meet cooking restrictions during holy times, no temperature changes will be displayed, and the double ovens will operate continuously at a previously selected temperature. Also, having two ovens means one can be dedicated to cooking meat dishes and the other dairy. Having won the approval of the owners many times over, this kitchen has gone on to win accolades from many others, too. 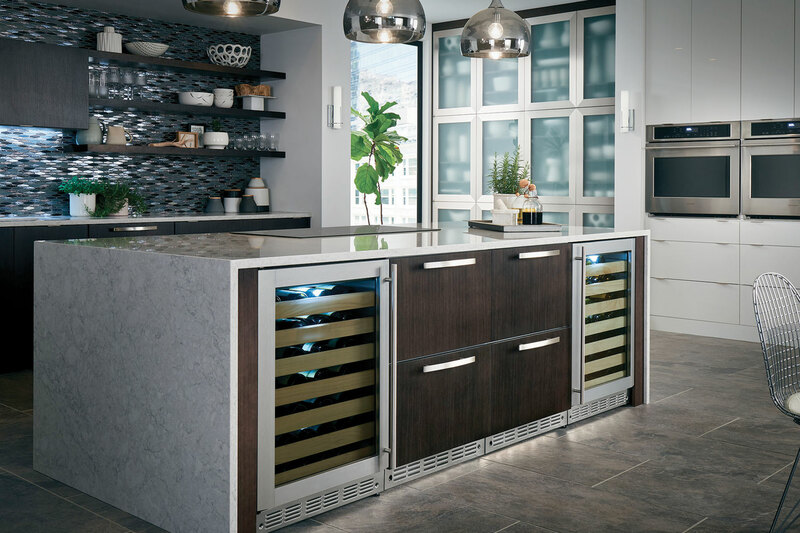 The NKBA Metro New York chapter presented El Design Studio with the award for best medium-size kitchen by a certified kitchen designer. It was also featured in Long Island’s luxury lifestyle magazine, House, in its 2018 kitchen and bath issue. We applaud Lopez’ design excellence and wish the owners many years of enjoyment from their gourmet Kosher kitchen.